What is a Street Team? It's a group of passionate book lovers who are dedicated to helping an author spread the word about their books - either a particular book or series, or all their books. In exchange, they often get exclusive goodies and information before anyone else. 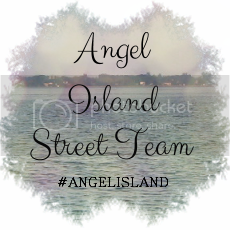 The Angel Island Street Team is for people who are interested in helping me spread the word about the Angel Island companion novels - Waiting for the Storm (published April 2013) and After the Storm (coming Spring 2014). My undying gratitude. Seriously. Self-promotion is hard (not to mention often uncomfortable because I’m shy and hate bugging people), so it means a lot to have a team of people who are dedicated to supporting me and helping spread the word about my books. The less time I spend pimping my books, the more time I spend writing new books! You can do as many or as few of these things as you want. Please don’t do anything you’re not comfortable with. I’m grateful for any and all help. If you’ve read and reviewed the books, post your reviews everywhere possible - blog, GoodReads, Amazon, Barnes & Noble, etc. Most people these days only seem to post on their blog and sometimes GoodReads, but Amazon reviews in particular are really helpful to authors. Reviews don’t have to be long (Amazon has something like a 20-word minimum), and they don’t even have to be positive (although I’m assuming you probably at least like the book(s) if you’re part of the Street Team). ;-) But seriously, just be honest - all reviews help. You can email me (irishstar_83(at)hotmail(dot)com) or tweet me (@SweetMarie83) anytime to share ideas, ask questions, give suggestions, or share pictures, etc with me.